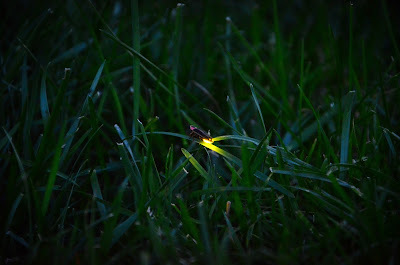 What do you think of when you see a firefly: a warm summer’s eve? sitting on the back porch or by the lake? how calming it is to watch the faint flickering lights? If you have ever had similar thoughts you are not alone. I believe God gave us fireflies for this very reason. If you were to guess how long fireflies live what would you guess: all summer? half the summer? In fact, adult fireflies live for only a couple of weeks! The fireflies you see at the end of the summer are not the same ones as you see at the beginning. It may not be a big surprise to you that they don’t live very long. Most insects have a short life-span. But the real surprise is how long they live as larvae before the adult stage. How long would you guess they spend as larvae? If you guessed two years you would be right! Try to imagine that! If human lives worked that way we would spend about 50 years as children and 18 years as adults! It would be so hard to have to wait that long to be grown up. As our lives are sometimes it seems hard to weight only 18 years or so to be fully grown. When we are teenagers we feel like we cannot wait another month to grow up. Perhaps God gave us an example in the firefly to remind us youth doesn’t last so long in comparison to adulthood. God could have made us like the firefly, but he didn’t. We need to remember to enjoy our youth. We need to remember to learn as much as we can before we have so much responsibility. We need to learn to enjoy the opportunities youth brings. Everything will happen in the right time. Most importantly, we need to remember to build a relationship with God in our youth. Even if we are no longer youth, the sooner in our lives we turn to God, the better. As King Solomon pointed out in Ecclesiastes 12:1, we ought to remember to start our lives off with God as young as we can. The firefly spends two years preparing for its short adult life. The more time we spend preparing for God’s purpose in our life by staying close to him the better our relationship with him will be. Why is it hard to wait to be grown up sometimes? Why did God give us childhood? Do you wish you could have been made an adult and skipped childhood? Photo Credit: Amanjeev via www.flickr.com under a CC 2.0 License.